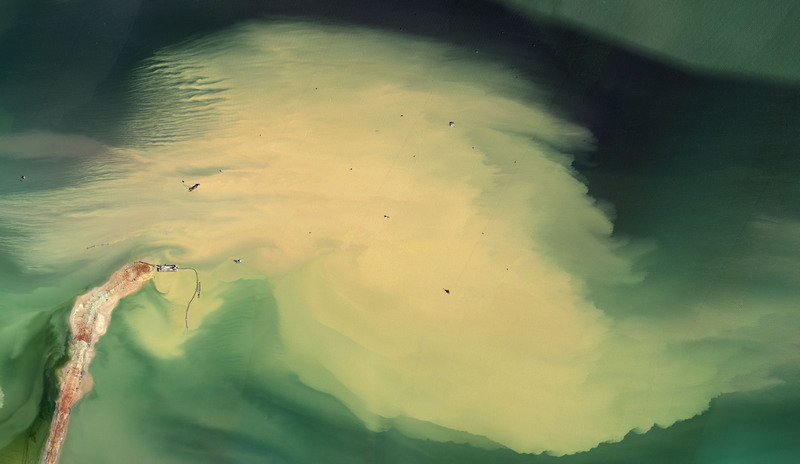 Mishka Henner, Cedar Point Oil Field, Harris County, Texas, 2013-14. © Mishka Henner. Image courtesy of Carroll / Fletcher. Cedar Point Oil Field, Harris County, Texas is from Henner’s Oil Fields series of large-scale photographic prints each of which is composed of hundreds of high-resolution satellite images of each location stitched together to show intricate detail. The prints are reminiscent of vast Abstract Expressionist canvases and represent landscapes carved by industries meeting extraordinary levels of consumer demand for one of North America’s most prized commodities: oil. Sourced from Google Earth, these satellite images of oil fields represent a systematic intent to maximise production and yield in order to satisfy extraordinary levels of human consumption. The result is a natural landscape transformed into something akin to the circuit boards that drive the logistical operations of these industries, and ultimately, feed consumers’ appetite for these resources. Mishka Henner’s Wasson Oil and Gas Field, Yoakum County, Texas, 2013-2014 from the Oil Series is also in the University of Salford Art Collection.